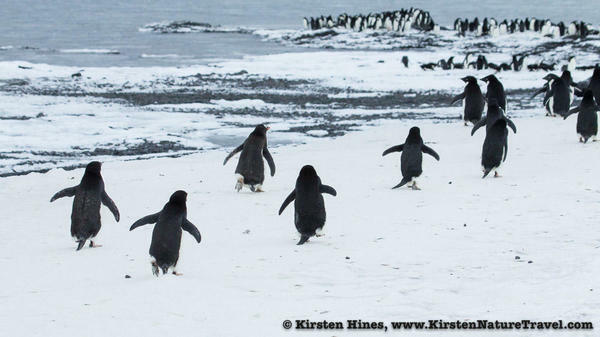 Ever wonder what might inspire a pack of penguins to pace incessantly across a snowy beach? 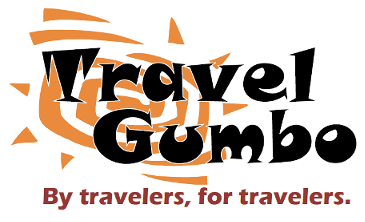 Join me on our last continent, Antarctica, to experience a cartoonish march with dire consequences. 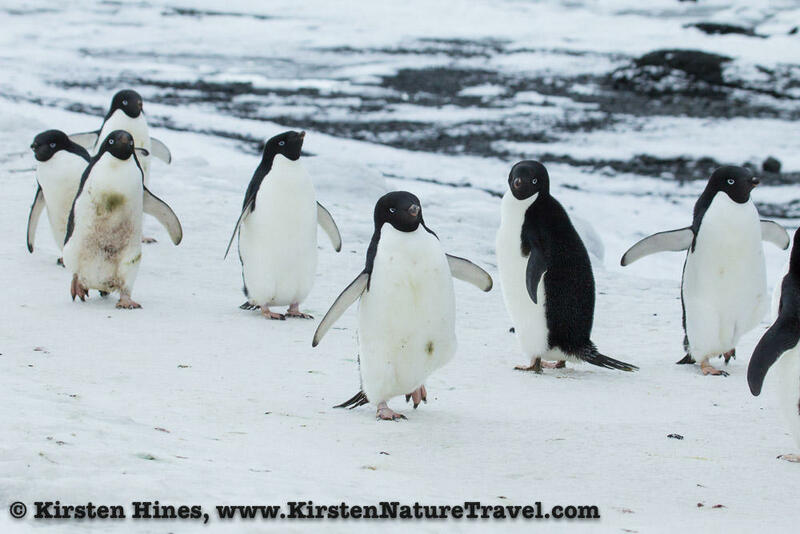 Adelie Penguins marched across the beach. Some waddled upright, wings outstretched to the sides as if approaching for an embrace. 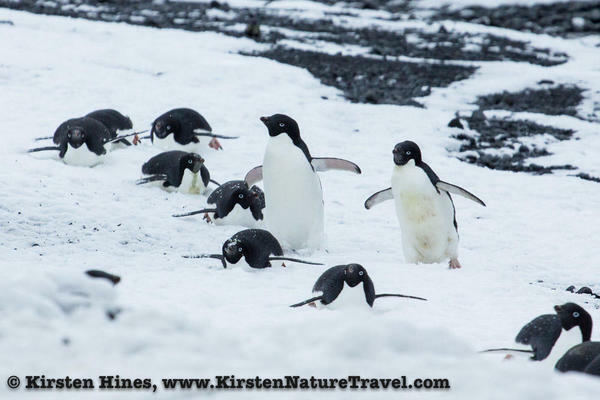 Others slid across packed snow on their bellies, bouncing to their feet to trip across patches of rocky sand then diving back to their built-in toboggans at the next patch of snow to propel themselves with flipper-like wings. Whatever the mode, the procession pushed toward the shoreline, pressing onto a tiny spit of land that extended furthest into the Weddell Sea. 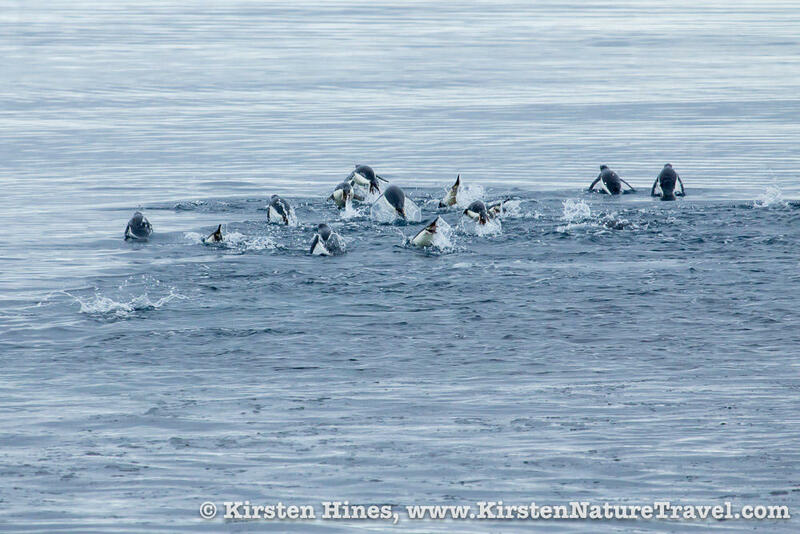 The penguins in front, those whose toes were teased by gray waters, stopped abruptly. 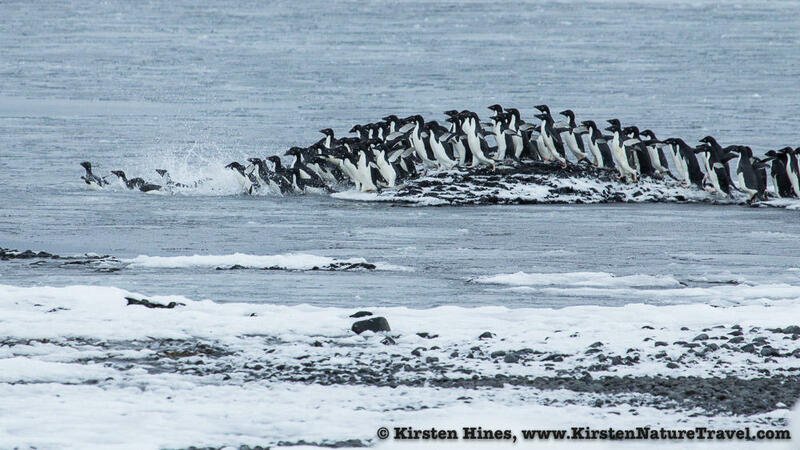 The action rippled slowly back across the surging pile of penguins until the cartoon-like gathering jostled to a halt. They stared at the turbulent waters a moment then, as if signaled by a conductor, the penguins turned away from the sea and marched back across the beach. Before they spread fully across the land, some unseen cue caused an about face and the penguins headed back toward the spit. They reenacted their comic pile, gazed across the choppy waters, then spun away from the spit and marched back across the land. I watched in amusement as the penguins paced to and from the spit all morning, flirting with the idea of a swim but turning away time after time. I suspected opposing instincts drove their indecisive migration. The previous days had been stormy, apparently too stormy for penguin fishing and hunger drove them to the spit. But their predators had undoubtedly also starved the last few days and some signal at the water’s edge reminded the penguins of this risk. Safety drove them away from the spit. Hunger. Safety. Hunger. Safety. The penguins vacillated between these survival forces until finally, the back of the pack refused to yield to the front’s cautionary pause. Penguins plowed from behind, forcing the frontline into the water. The front line of penguins being forced into the Weddell Sea. Adelie Penguins swimming toward open water. Forced to act, the leading penguins porpoised forward. The water filled with torpedo-like jack-in-the-boxes rushing madly through narrow, confined waters to the open sea beyond. It was then that the long sleek torso of a Leopard Seal cut through the frenzy, becoming ground zero as penguins split in all directions from the seal’s point of emergence. Penguins ocean-side sprayed forward toward freedom; those land-side dashed back toward the beach’s safety. One penguin remained in the middle, seemingly frozen in place despite flailing wings. Clenched tightly in seal jaws, this unfortunate soul’s struggles were futile. The seal shook the penguin from side to side like a retriever with a favorite toy, flipping it through the air until the bird hung limp. The penguins on the beach did not watch. They scattered down shore, away from the danger. The seal gave its prey one final shake, then dragged its newly caught dinner below. As soon as the seal submerged, the water’s surface glassed over as if nothing had happened. And as if nothing had happened, the penguins on the beach resumed their march. 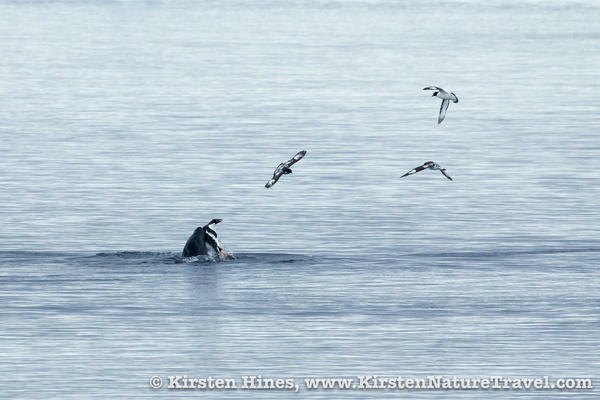 Leopard Seal flings its Adelaide Penguin prey into the air. Awesome photos!! I especially loved the group lined up to jump into the water...well done! !